For help identifying possible sources of dog skin conditions, we at Camp Basenji refer to the Dog Health Guide. But do not delay consulting with your vet! Some skin conditions, including those caused by puppy mange or sensitivities, can escalate to staph infections. And, when not corrected early, puppy mange or skin irritations become harder to resolve and often require more chemicals or antibiotics. If you suspect fleas are the source of your dog’s skin condition, you MUST eliminate fleas from your dog AND your home. 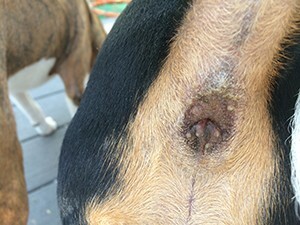 With some Basenjis just one flea bite will cause your friend to chew a hole in his coat and possibly skin. Use topical products like Advantix II to repel and kill fleas as well as minimize your dog’s discomfort. But to maximize their effectiveness, forgo bathing your Basenji for 48 hours before and after use of most topicals. Alternatively, oral medications to kill fleas include Comfortis and NextGuard. Capstar, often used by shelters and vet offices, provides one-day protection. Exercise caution when selecting a flea shampoo or chemical preventives. Some Basenjis are sensitive to products containing poisons or neurotoxins and suffer significant side effects. To avoid overdosing your pal, observe instructions regarding frequency of application and adhere to dosing guidelines, which normally tie to dog weight. At Camp Basenji, we find some flea preventives work when slightly under dosed. Under-dosing minimizes dog exposure to chemicals. Unless your dog has a heavy infestation, you may find natural products repel and/or kill fleas. To help control fleas, regularly clean dog bedding and furnishings. Reducing carpeted areas simplifies flea control. Fight skin issues with a holistic approach. Stress, for example, can exacerbate reactions to environmental irritants. Similarly, providing an elevated place to lay outside also can help reduce problems. Although Basenjis generally detest water for anything but drinking, a daily rinse is the only way to remove pollens that collect on their coats. Wiping with a wet washcloth helps but is less effective. We recommend against regular washing with shampoos because that strips the coat and skin of natural oils. Finally, consider whether food allergies or sensitivities may be contributing to any skin problems you encounter.